Bridgewater, NJ – The Somerset Patriots have signed right-handed pitcher and 2015 Atlantic League All-Star Lucas Irvine for the 2017 season. 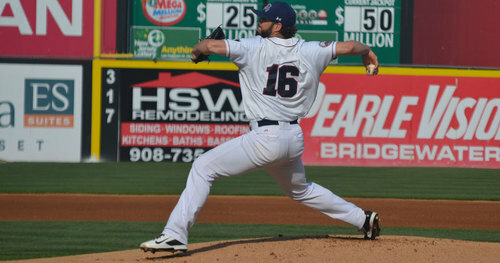 Irvine enters his second season with the Somerset Patriots and second in the Atlantic League. Irvine went 6-8 with the Patriots in 2015 and was named a mid-season All-Star. His 3.41 ERA ranked sixth-best in the league, while his 106 strikeouts tied him with teammate Matt Zielinski for tops on the team and eighth in the Atlantic League. Irvine also finished second on the team in innings pitched (129.1). The Kansas City, Missouri resident had his contract purchased by the Arizona Diamondbacks towards the end of the 2015 season, and proceeded to go 2-0 with a 2.13 ERA in two starts with High-A Visalia. Irvine spent most of 2016 with the Diamondbacks and combined for a 5-3 record with a 3.98 ERA and 52 strikeouts spread across 14 games (nine starts) between the High-A, Double-A and Triple-A levels. The Northwestern State University of Louisiana alumnus owns a 31-27 record with a 3.38 ERA and 505 strikeouts over 135 games (95 starts) in his five-year professional career.